I hope you have so far enjoyed the lessons. Today, we will review the negative form of sentences in Present Perfect Tense. We have already covered this in Lesson 31. For ease of operation – and to help you to understand it better – I will use the same ten verbs we have so far used in the past few weeks. Please follow the examples below and finish the job. Good luck! I haven’t gone to Brazil. من به برزیل نرفته ام. 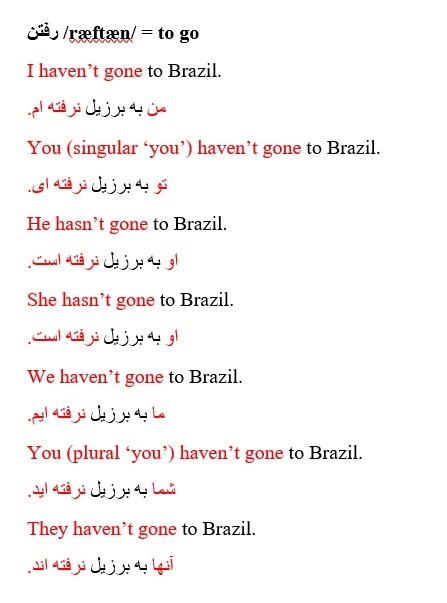 You (singular ‘you’) haven’t gone to Brazil. He hasn’t gone to Brazil. She hasn’t gone to Brazil. We haven’t gone to Brazil. You (plural ‘you’) haven’t gone to Brazil. They haven’t gone to Brazil. 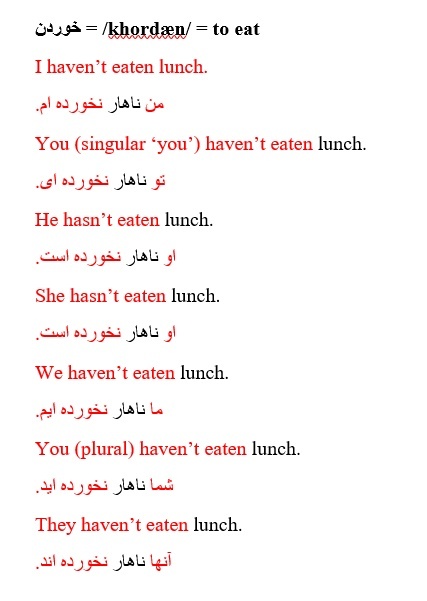 You (singular ‘you’) haven’t eaten lunch. You (plural) haven’t eaten lunch. I haven’t listened to the radio. من به رادیو گوش نکرده ام. 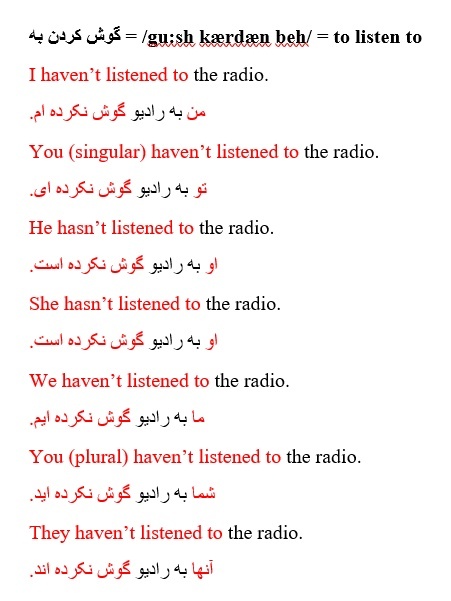 You (singular) haven’t listened to the radio. He hasn’t listened to the radio. She hasn’t listened to the radio. We haven’t listened to the radio. You (plural) haven’t listened to the radio. They haven’t listened to the radio. I haven’t seen your friend. من دوستت را ندیده ام. You (singular) haven’t seen your friend. He hasn’t seen your friend. She hasn’t seen your friend. We haven’t seen your friend. 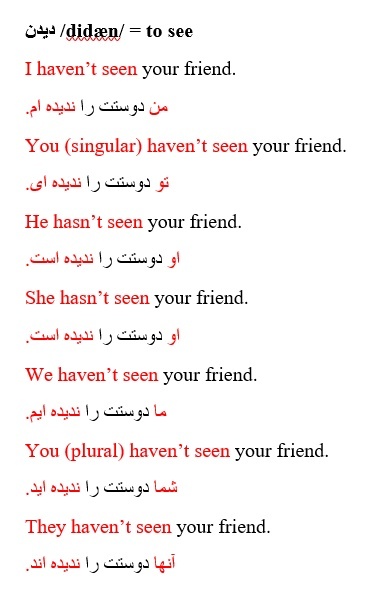 You (plural) haven’t seen your friend. They haven’t seen your friend. I haven’t read a book. You (singular) haven’t read a book. He hasn’t read a book. She hasn’t read a book. We haven’t read a book. 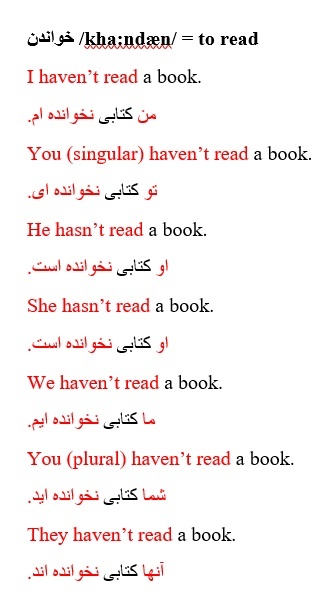 You (plural) haven’t read a book. They haven’t read a book. I haven’t written a letter. من نامه ای ننوشته ام. You (singular) haven’t written a letter. He hasn’t written a letter. She hasn’t written a letter. We haven’t written a letter. 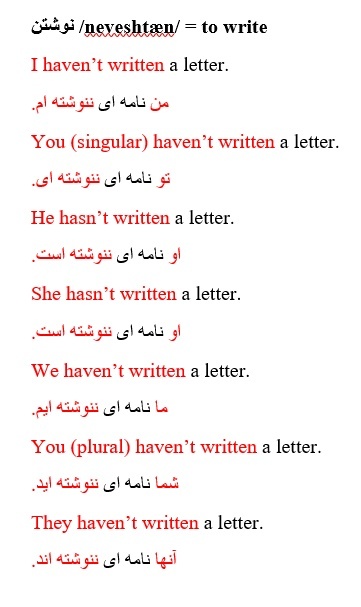 You (plural) haven’t written a letter. They haven’t written a letter. I haven’t cleaned my car. من ماشینم را تمیز نکرده ام. You (singular) haven’t cleaned my car. He hasn’t cleaned my car. She hasn’t cleaned my car. We haven’t cleaned my car. 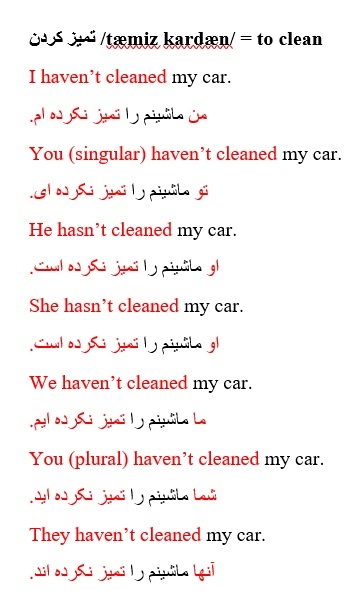 You (plural) haven’t cleaned my car. They haven’t cleaned my car. I haven’t sold my house. من خانه ام را نفروخته ام. 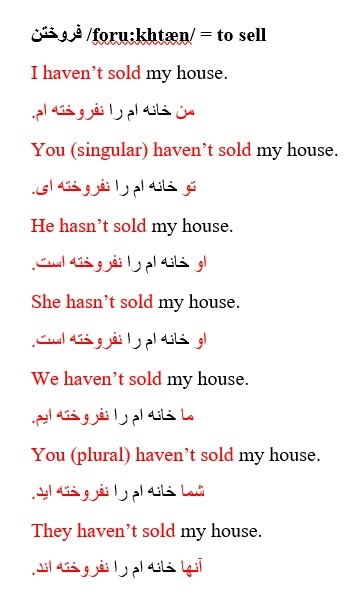 You (singular) haven’t sold my house. He hasn’t sold my house. She hasn’t sold my house. We haven’t sold my house. You (plural) haven’t sold my house. They haven’t sold my house. I haven’t washed the dishes. 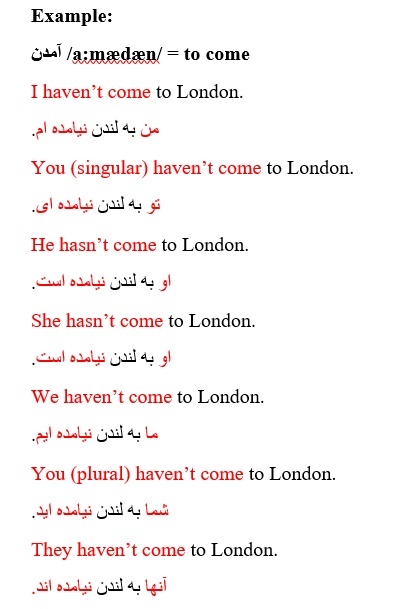 من ظرف ها را نشسته ام. You (singular) haven’t washed the dishes. He hasn’t washed the dishes. She hasn’t washed the dishes. We haven’t washed the dishes. 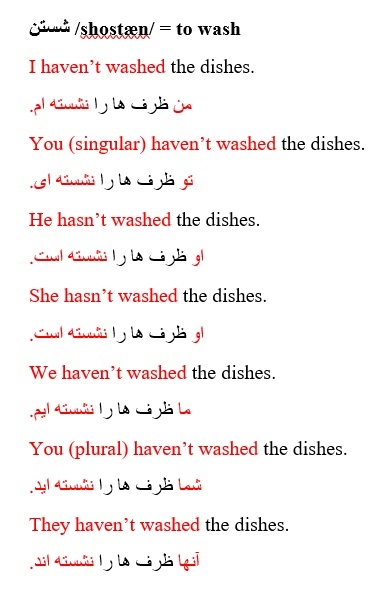 You (plural) haven’t washed the dishes. They haven’t washed the dishes. I haven’t bought a car. You (singular) haven’t bought a car. He hasn’t bought a car. She hasn’t bought a car. We haven’t bought a car. 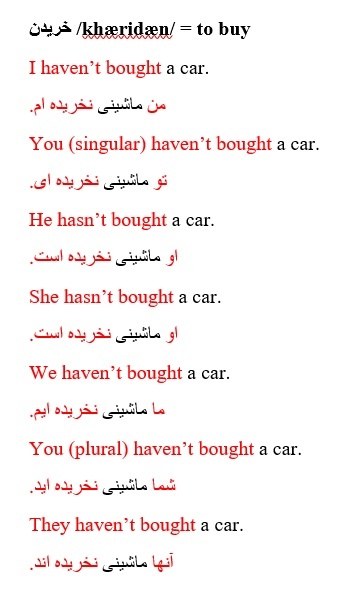 You (plural) haven’t bought a car. They haven’t bought a car.